“The public knows as much about collecting as I do about the Italian opera, which is that fat people get up and sing in a dead language.” A guy calls me up and says, “Hey, did you see where the last Hemicuda convertible was only bid to $800,000 at the Mecom auction last week?” I immediately vision the white Plymouth with billboards. I shot that Mopar a few years ago for a magazine. The caller is wrong. The car in question was a blue ’71 in a hardtop, reputed to be the last one built. The 800K was the top bid. The car didn’t sell. Experienced collectors there tell me the “real money” dropped out at around a half million. This sounds right. Now, stay with me. We’re looking into the state of the market. Have prices gone down? There is an “elite market” out there, which I’m not sure you can really call a market, in terms of reproducible prices. They get the major headlines, not the hot GTOs with 389 four barrels, or the Olds 4-4-2s, the 383 Road Runners, and so on. These vehicles make up the major part of the muscle car market that the Joe Averages can buy. Notice I used the term “collector” in contrast to the guy who phoned me up that wasn’t really a collector. There’s a big difference. The public knows as much about collecting as I do about the Italian opera, which is that fat people get up and sing in a foreign language. A muscle car sells for a million bucks; most people think their Uncle Fred’s rusty GTX is worth a fortune. If you think the market is down, you should try to buy one of the little guy cars, like a Boss 302 Mustang, which isn’t so little guy these days. A ’70 model, yellow with black stripes and a shaker, as an example, recently sold in a private sale for $92,000. Okay, so what was the price a couple years ago on this car? I’d say more like $42,000. There are trends inside different markets. In the Mustangs and Fords, lately collectors have jumped off the big prices on Shelby big block convertibles and gone looking elsewhere, like to Bosses and Cobra Jets, Torinos and Fairlanes, Comets and Cyclones. Now, go back with me to the elite collectors. A couple years ago the 1971 Hemicuda coupes were less than they are right now. But, go back a year or less when the market was in frenzy and I think you’ll find that a few of these rarities cracked the million-dollar mark. Of course, in the convertible, the ’71 was like three mil. Here’s the trend, then. Yes, prices have settled down. Nothing goes straight up and keeps going straight up. Look at your stock market or your housing market. Prices have to relax. How much have they relaxed? Basically, they’ve dropped (on the upper end cars, say over 100 grand) to less than last year’s prices and more than prices were two to two and a half years ago. For example, a 1970 Hemicuda is still $200,000. This is in a coupe, not a convertible, of course. This figure is definitely higher than two years ago (how much, 80K? ), but down from the past year or so (what, 300K? ), when a flurry of collectors entered the market hunting their ultimate ride. Another variable here of note is the big prices are mainly surfacing in the auctions. Apparently, competition from bidders pushes up price. (Remember the one million dollar LS6 Chevelle convertible at last year’s B-J auction?) When a Van Gogh painting comes up for sale, if you want it and there are 3-4 other people who want it, the price goes up. At the same sale where the ’71 Hemicuda coupe was an 800K no sale, a Hemi Superbird sold for $400,000. That’s huge money on a recent sale. Another big factor in the elite market is the eclectic tastes of the buyers. Take one Yenko Camaro against another Yenko Camaro, for example, both cars real, both cars restored. There’s a reason a collector from Florida paid $1.3 million dollars for a certain SYC Camaro. The car was just the right color and had the documentation, and even more important was the fact the buyer was extremely wealthy and had to have a certain Camaro that another wealthy collector owned who didn’t want to sell. When the price got ridiculous, he finally did sell. Big prices are not necessarily reality in the sense of making a market. You have to wonder what the elite market has to do with the rest of the collecting world. There is the sense of perception. 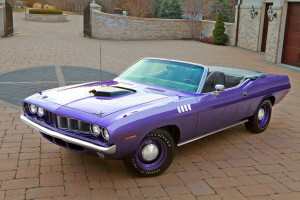 If a ’71 Hemicuda convertible is worth millions, what’s my 440 Six Pack ‘Cuda convertible worth? Or, what’s my 383 Road Runner worth? Elite collectors are not buying the 383s. The effect is this: Big money has priced most of the diehard old car collectors out of the game, so they do what we as kids did many years ago. We bought Z/28 badges for our Camaros because we couldn’t afford a real Z, but our cars were just as fast. Or, we added Shelby stripes to our Mustang fastback. Today, these enthusiasts clone the rides they lust after. Personally, I don’t think building clones is good business. I mean, a collector (are these builders real collectors?) gets a buck and a quarter into a Hemicuda convertible clone and what does he have? I think these people are mostly made up of builders. Getting back on track with trends, if the elite market is higher than it was two years ago, but lower than last year, what has happened to the under $50,000 cars? Actually, these prices are higher, overall. We haven’t seen these vehicles pull back. That’s what’s important to know. The frenzy of 2004-2005 is over. The market, however, remains extremely strong.